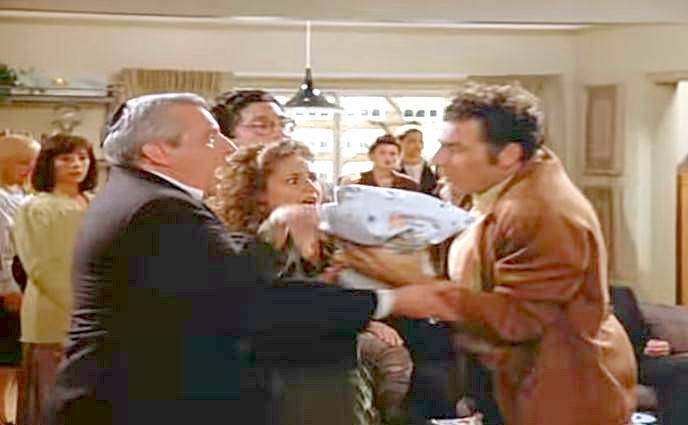 In one of the few explicitly Jewish episodes of the Seinfeld sitcom, Elaine and Jerry help friends find a mohel to perform a bris on their newborn son. When the mohel shows up at the apartment, he's not exactly what they expect. In fact, he's eccentric, somewhat shaky, and manages to cut Jerry's finger in the process. Here's a compilation of clips from within the episode. Enjoy! the characterization of the mohel is not funny, taking a solemn ritual and adding fear factor to the brit, I would be afraid to have my son circumcised by seeing this, but I'm an octogenarian, so what do I know!